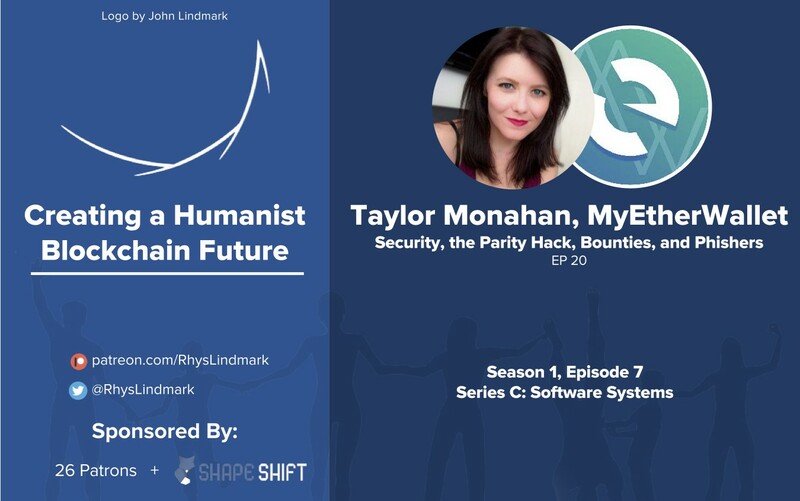 In this episode of Creating a Humanist Blockchain Future (Youtube, Soundcloud, iTunes), I interview Taylor Monahan, a co-founder of MyEtherWallet. We chat about security, the Parity exploit, audits, bounties, the tradeoffs in reusing code, and how to deal with scams/phishers. If you’re interested in blockchain-based security, definitely give it a listen! And, as always, let me know if you have any feedback! Thanks to Mike Goldin, John Desmond, Colin Wielga, Harry Lindmark, Joe Urgo, John Lindmark, Jacob Zax, Katie Powell, Jonathan Isaac, Brady McKenna, Jeff Snyder, Ryan X Charles, Chris Edmonds, Ned Mills, Kenji Williams, Scott Levi, Peter Rodgers, Keith Klundt, and Kenzie Jacobs for supporting me on Patreon!